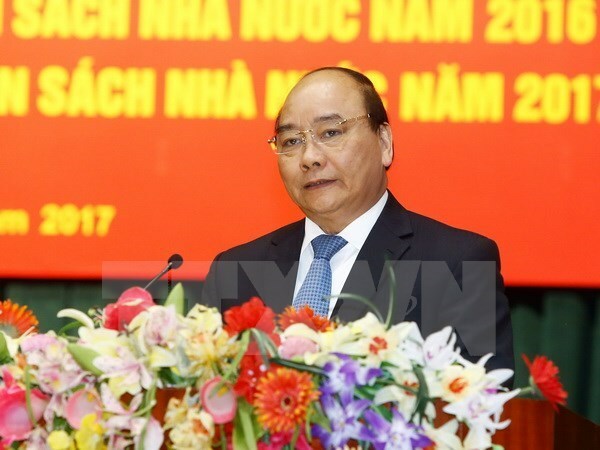 Hanoi (VNA) – Prime Minister Nguyen Xuan Phuc asked the Finance Ministry to take prompt measures to collect revenues for the State budget right from the beginning of the year at the ministry’s teleconference in Hanoi on January 6. Last year, total State budget revenues hit 1,094 trillion VND (47.56 billion USD), up 7.8 percent from the estimate. Up to 58 out of 63 localities met budget collection targets despite difficulties caused by natural disasters across the country and fluctuations in the regional and world financial market. The outstanding public debts were equivalent to 64.73 percent of the gross domestic product (GDP) and the government debts - 53.62 percent of the GDP, which were within the permissible levels. PM Phuc hailed the financial sector as one of the pioneers in implementing administrative reform and improving business and investment environment in line with the Government’s Resolution 19. At the same time, the PM expressed his concern over the high level of public debts and increasing regular expenditures which have put a strain on the State budget, warning that unless the trend is stopped, the national finance will inevitably collapse. Legal regulations on taxation, finance and customs remain overlapping and asynchronous, posing difficulties to manufacturing and trade as well as financial and budget management, he said. According to the PM, it will be difficult tasks to achieve the goals of 6.7 percent economic growth, overspending below 3.5 percent of GDP and 4 percent inflation. The Finance Ministry needs to well manage fiscal tools to stabilise the macro-economy while making breakthrough reforms in budget management to reduce overspending and ensure solvency, he said. The PM directed the sector to closely monitor tax declarations as well as cases of trade fraud and transfer pricing to prevent tax evasion while continuing to exempt and cut agricultural taxes, review existing preferential taxes. At the same time, the ministry must crack down on wastefulness and scale down expenditures for conferences and procurement of expensive assets, he said, adding that personal responsibility for causing budget losses must be clarified and violations must be strictly punished, thereby strengthening public trust in the Party and State. The leader hailed the ministry’s pilot model of offering fixed expenditure for transport for government agencies, saying that the sector needs to strive to reduce the number of government-plate vehicles which should be auctioned to bring more revenues to the State budget. However, he pointed out that the biggest public asset is public offices and land which have not been managed well and used effectively, thus becoming a hotbed of corruption and vested interest, blocking economic growth. He urged research for appropriate methods to effectively manage and tap this extremely important resource.